Looking for a creative costume that you can make easily? If you're a fan of Duck Dynasty, how about dressing up as Phil Robertson? Pull some clothes from your closet, the thrift store, or the army surplus for the bulk of the outfit. 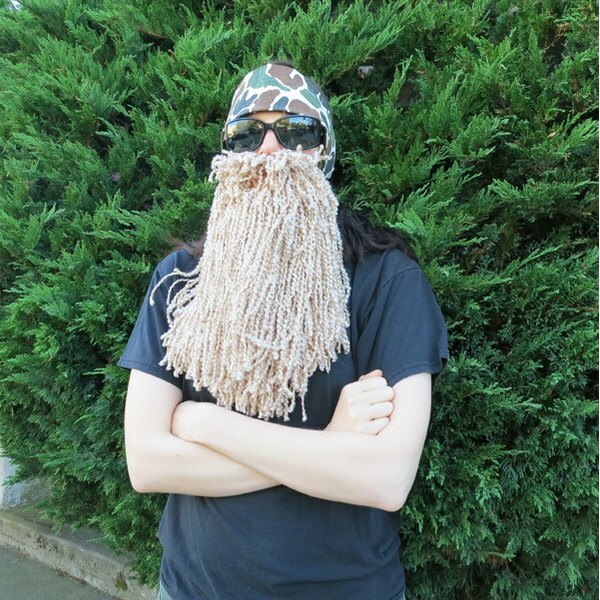 Grab yarn and a few other craft supplies and follow these instructions to make a beard to rival those on Duck Dynasty--Duck Commander calls not included! To make a Phil Robertson costume, you will need: a black or camo-print shirt, camo or olive drab pants, camo-print fabric or bandana, sunglasses, and a beard. Read on for more specific instructions to create a beard. To make a beard you will need: a piece of felt, yarn, thread, scissors, and a sewing machine. If you don't have a sewing machine you can sew the beard by hand or use a hot glue gun. To make the beard as realistic as possible, pick a yarn that has texture and is the color of hair. Cut the felt into a half-moon shape that covers your upper lip and chin. Cut a small hole for your mouth. Cut the yarn into pieces that are twice the length of your desired finished beard. The beard shown uses pieces of yarn that are about 16 inches long. The exact number of pieces you use will depend upon the thickness of the yarn and the width of your piece of felt. This long and full beard used half of a skein of yarn. Lay yarn onto the felt so that it evenly covers the felt, centering lengthwise. Use a straight stitch on your sewing machine to sew it down in a curved line along the bottom edge of the felt. If you prefer hand-stitching, make sure you put a stitch in each piece of yarn. Or use a hot glue gun and carefully lay the pieces of yarn on top of the glue, pressing the yarn down on either side of the glue line, being careful not to burn your fingers. Allow the glue to cool completely before moving onto the next step. Let both ends of the sewed-on yarn hang down, as they will when you put on the beard, so that they don't get caught in the stitching when you sew down the next layers of yarn. The top half of the piece of yarn will hang down so that it covers the stitching. Lay down another layer of yarn higher up on the felt base and sew or glue it down in the same manner as the first layer of yarn. Repeat one more time, sewing the final yarn layer just under the mouth hole. The accompanying picture shows the lines of stitching from the back of the beard. Cut a handful of pieces of yarn that are about 3 inches long and sew or glue them to the upper lip as you did for the beard layers. Sew a long piece of yarn to the left and right edges of the beard to use as ties. If you prefer, you can use ribbon or a strip of fabric instead of long pieces of yarn. Put on the shirt and pants. Tie the camo fabric/bandana across your forehead. Put the beard on and tie it around the back of your head. Look in a mirror and decide if you want to trim the beard or mustache so that it is more shapely. Put on your sunglasses and you're Phil Robertson from Duck Dynasty. If you'd rather be crazy Uncle Si, take off the sunglasses and camo bandana and put on a camo-print baseball cap and reading glasses instead.